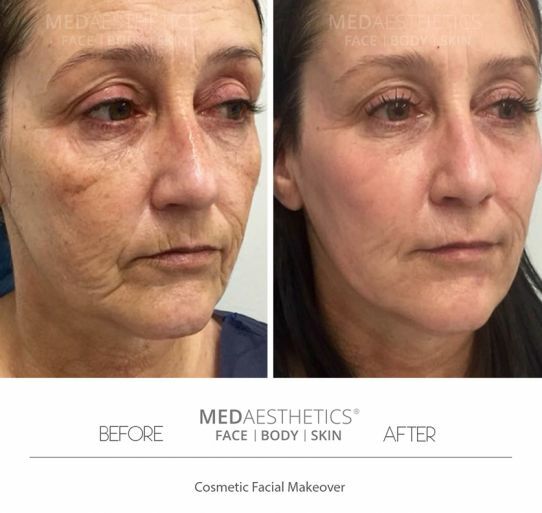 At Medaesthetics® we are Allergan™ Platinum Plus cosmetic injectables clinic performing several thousand treatments each year. Arguably the number one cosmetic medical treatment in the world, Anti-wrinkle Injections involve the use of a natural, purified protein that relaxes wrinkle-causing facial muscles, creating a smooth, rejuvenated and fresh appearance. Anti-wrinkle injection treatment is effective, relatively affordable and convenient and with no downtime. What are Anti-Wrinkle Injections made of? The substance used as a muscle relaxant in Anti-Wrinkle Injections is a naturally occurring purified protein. It is not a man-made chemical or a snake venom. In Australia, this is a schedule-4 drug, which can only be prescribed by a medical doctor. Due to TGA restrictions, we are unable to mention the name of the drug. Anti-wrinkle Injections work by inhibiting the transmission of signals between the nerves and the injected muscles. This temporarily relaxes the muscles, so they do not contract too forcefully. This gives the overlying skin a chance to rest and repair itself so that the wrinkles become less obvious or completely disappear. The use of Anti-Wrinkle Injections not only reduces existing lines and wrinkles but also prevents future ones from forming. The safety profile of Anti-Wrinkle Injections is excellent. Apart from the extremely rare risk of allergic reaction, there are no major side effects associated with Anti-wrinkle injection treatment. At Medaesthetics™, we prefer to use topical numbing cream, ice and a special vibration anaesthesia device for all facial injection procedures. This minimises any anxiety or discomfort associated with this treatment. we often find that all new patients are pleasantly surprised by our painless injection techniques. Generally, there are very few side effects associated with Anti-Wrinkle Injections and most of them are transient in nature. Minor swelling and redness at injection site usually resolve within first few minutes. Some people may experience mild, short-term bruising which is easily covered with makeup. Mild headache after the treatment has also been reported, which can be treated with oral painkillers like panadol. In rare cases, the Anti-Wrinkle Injection medication can spread beyond the desired muscle when injected in the frown region and may cause temporary drooping of the upper eyelid. This is extremely rare in the hands of an experienced injector and is treatable with topical eye drops in most cases. It usually resolves within a few weeks. How long does the procedure take and is there a follow up? The initial consultation may take between 15–20 minutes. After consent is obtained, the procedure itself takes approximately 5 to 10 minutes only. A follow-up appointment is only required after 2 weeks if the treatment has not kicked in properly. This is extremely rare. Most clients return to work or normally activities immediately following the treatment. It is recommended that you avoid strenuous exercise, heavy lifting and massaging of the injected area for 24 hours. The treatment will start to take effect usually within two to three days. The maximum effect is usually seen in 7–14 days. The degree of improvement varies from person to person, but the results last for 3-4 months in most cases. Repeat treatment is recommended when movement in the area starts to return. The aim of Anti-wrinkle treatment is to look refreshed and not to look “frozen” or “stunned”. In the hands of a good injecting doctor, the results look natural with appropriate facial expressions. What can I do to prepare myself for this treatment? To minimise the possibility of bruising, it is best to avoid anti-inflammatory medication such as aspirin and Nurofen (Ibuprofen), fish oil, green tea, garlic, ginkgo and other herbal products that may thin the blood. These should be stopped at least a week prior to your planned treatment date. What are Wrinkle Relaxer Injections?